Pencil on paper. 2013. We are quite different to previous cultures, in that we don't attach any sacred or metaphysical aspect to geometry. Our nearest secular equivalent to metaphysical inquiry, theoretical physics, does use terms such a super-symmetry, but our modern culture sees geometry in purely practical terms. Previous cultures though, especially ancient cultures, once they had discovered geometry, invariable ascribed a religious or sacred meaning to it. This ongoing series of drawings takes the idea that a pure geometry underpins the natural world, common even in the ideas of the Age of Enlightenment and masonic beliefs, and merges it with my fascination for patterns. 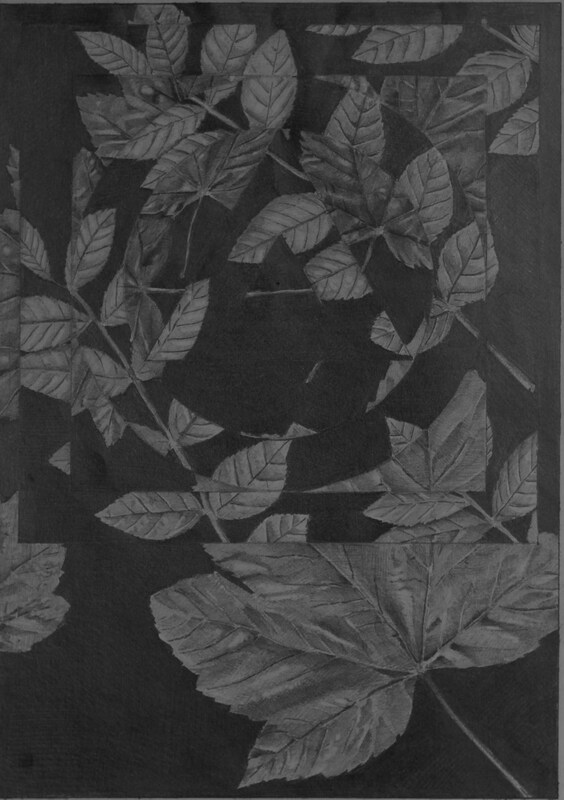 In the resulting drawings, clear geometrical patterns reveal themselves through the interplay of different leaf shapes.